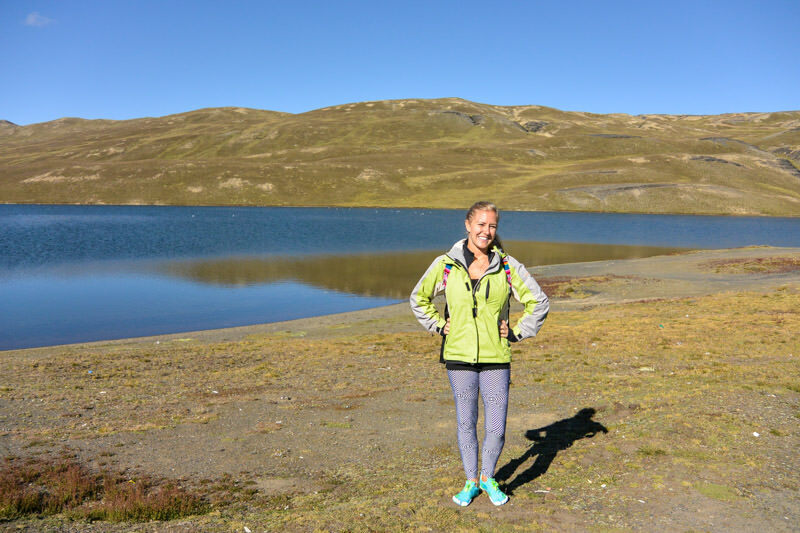 While I really didn’t think I was going to like La Paz Bolivia… I ended up being totally wrong. 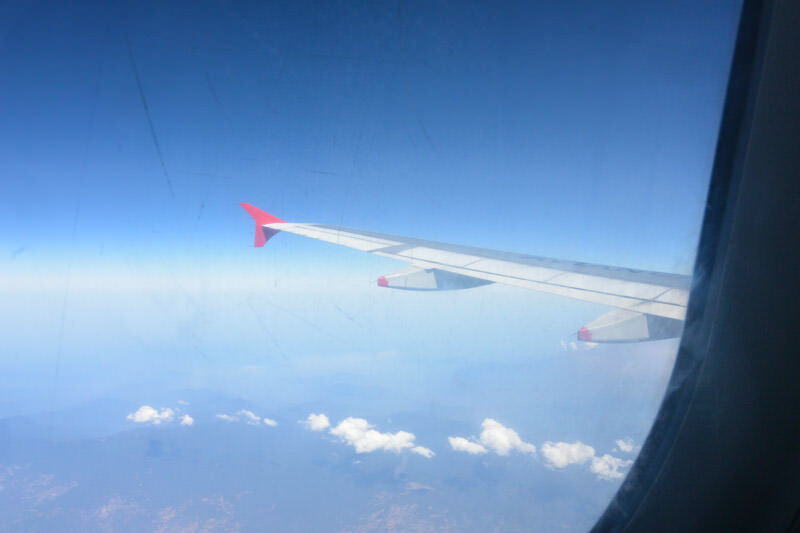 I had based my assumptions on what I’d read in Lonely Planet, and other travel blogs online. Everything I read portrayed La Paz as gray, boring, dull, unworthy… on and on and on with about every negative adjective I could think to use to describe a city I wouldn’t be interested in. Which made it even more surprising when I loved La Paz enough to spend a week there, and even come back for a round 2! 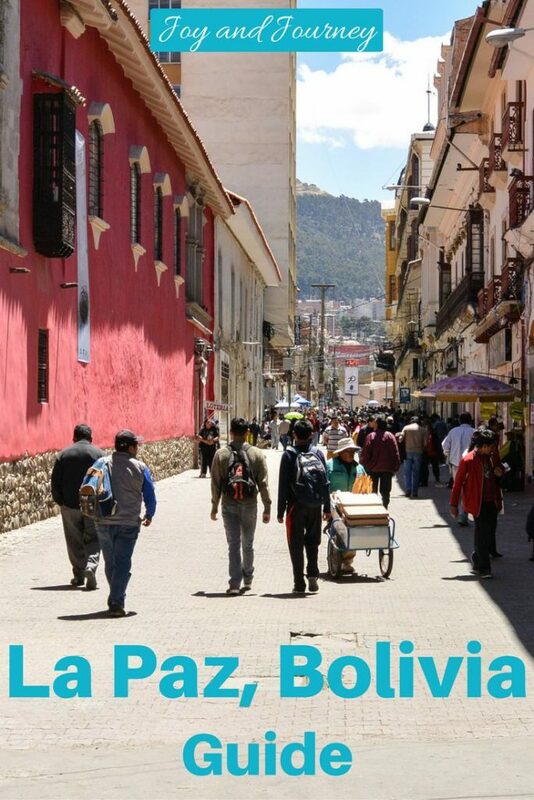 This La Paz Bolivia guide will provide all the information I didn’t have (and some I did) before going to Bolivia’s best known “big” city. 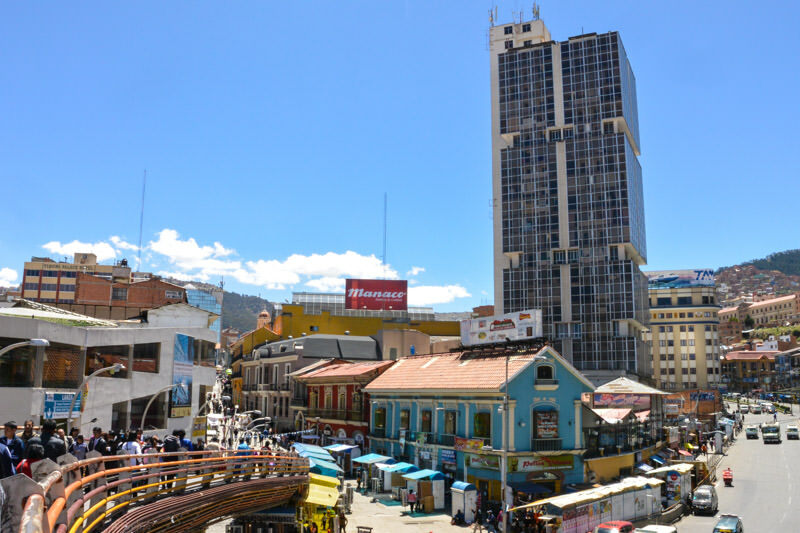 Most people come to La Paz in one of 3 ways: flying into El Alto Airport, arriving from a domestic destination to the bus station, or arriving from an international destination to the bus station. El Alto Airport (code LPB) is one of the highest altitude international airports in the world at over 13,000 feet above sea level (half as high as cruising altitude). It is a little less than 30 minutes from the center of La Paz, and a taxi ride to city center should cost around Bs50. 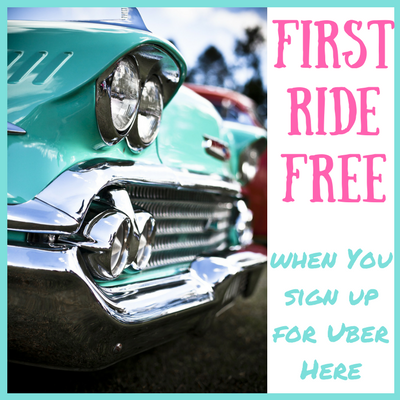 Most hotels can arrange a taxi to pick you up for a small extra charge (the best idea if you’re arriving late at night), or you can take a radio taxi from the airport yourself. If you are on a budget and want to save some money, there are minibus departures every few minutes throughout the day. This form of shared transportation will take you into the city center and costs less Than Bs10. One of the reputable companies is called GoTransTur, and the buses can be found behind the taxi lineup. The main bus station is located at Avenida Peru and Ismael Montes. It is about 20-25 minutes walk to the center, which may be a bit far with bags (though do-able), and taxis wait outside the entrance. If you’re arriving from an International Destination to the La Paz Bus Station: Be sure to double check on your requirements for Bolivian immigration, don’t get (almost) stranded like Lavi at the Peru/Bolivia border! 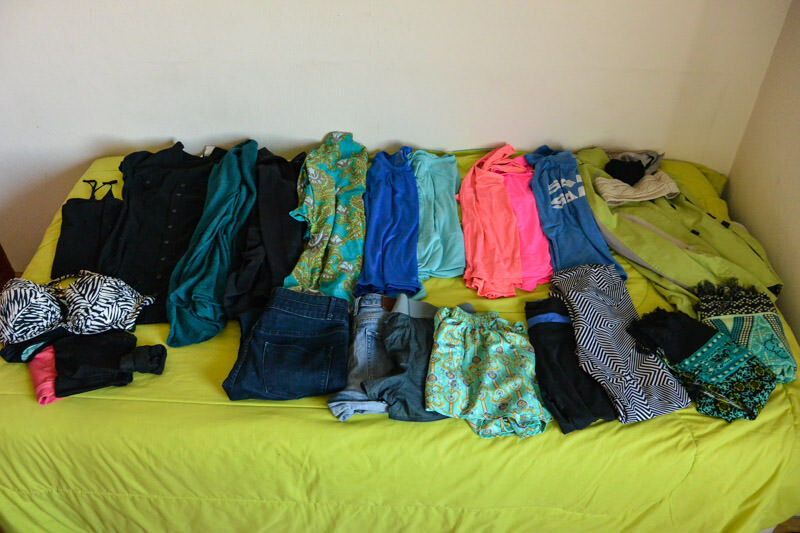 My biggest saving grace for La Paz was that I packed a LOT of layers. The temperature varied widely, especially from daylight to night time, and even in the chill morning air I got hot quickly from walking the steep hills. My usual outfit consisted of flats, medium weight leggings, a tank top, and a lightweight jacket on top. I wore a scarf and added a sweater on colder days. I would recommend packing ONLY clothes that keep your legs covered. I wore shorts one day, and while no one said anything, I felt really out of place (mine and Lavi’s naked legs were the only ones in sight, and I definitely felt naked). Pack at least one pair of jeans and a pair of lightweight leggings (for the ladies, especially under dresses) for any warmish days. 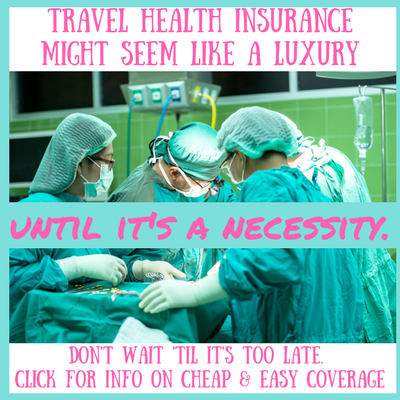 While it may seem odd at first, definitely pack sunscreen. The high altitude and clear skies make a sunburn totally possible. It happened to me! 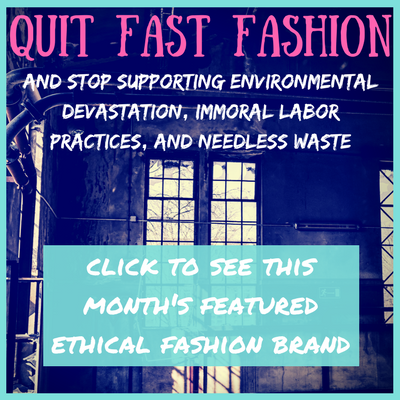 Either pack a scarf, hat, and gloves or even better: buy them there! As in most big cities anywhere in the world, use common sense and don’t flash valuables around. In any crowded area (especially plazas), be mindful of pickpockets and thieves. Bag slashers are not uncommon, so be sure to choose a cut-proof bag or wear your valuables close to you, like in a money belt. Leave valuable items in the hotel safe if possible. If someone claims to be an undercover police officer and wants to see your passport or accompany you somewhere – refuse. Plainclothes police officers don’t hassle tourists, and anyone claiming to be one is likely up to no good. Reported muggings and thefts have occurred in this way, sometimes the “officer” pretends to do a drug search. If in doubt, insist on going to the police station. Only take radio cabs (they have the call center telephone number on a bubble on the top of the cab). Taking a taxi off the street can be dangerous, especially at night, as express kidnappings and muggings are not uncommon. Don’t share a taxi with people you don’t know. 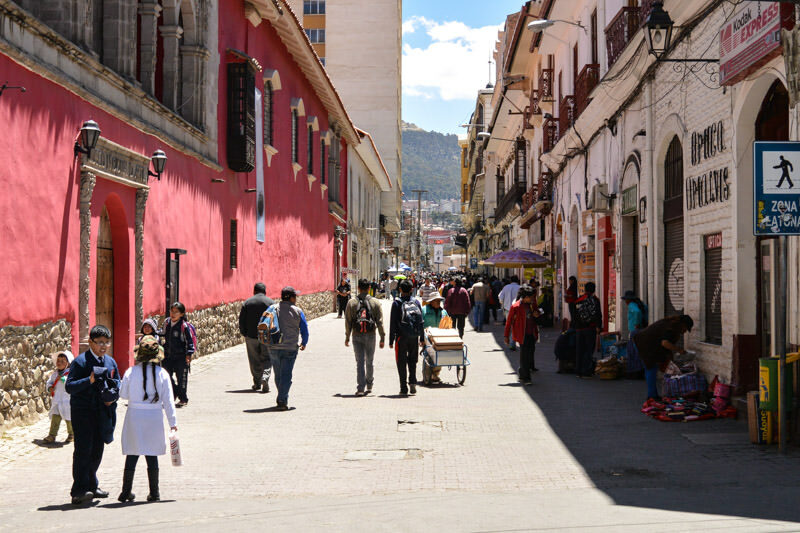 At over 10,000 feet above sea level, visitors to La Paz can be struck with altitude sickness. Gingko balboa supplements are a common preventative treatment, and coca leaf tea is a popular treatment. Make sure you are staying hydrated and drinking enough water. If you stay near the city center, most of La Paz will be within walking distance. While walking can be somewhat strenuous (due to the intense hills), it is doable for most people of average fitness. Give yourself a few days to become acclimated to the altitude, and walking will feel infinitely easier. As suggested above in safety, always use a radio taxi or a taxi called by your hotel. The taxis do not run on a meter system, so agree on a fare before getting in. Most distances within downtown La Paz should be under 10Bs. Minibuses are a local, cheap, and fun way to travel. Knowing a bit of Spanish will definitely help, as the minibuses (aka trufis) do not generally have designated stops. The fare is 2-3Bs. This well-known party hostel proved to me once and for all that I’m definitely getting old. The hard-partying ways of the majority of the other travelers (actually, pretty much everyone other than me) made it hard to sleep at night if I didn’t have a few too many drinks and wanted to pass out before 2am. While signs everywhere forbid drug use, it wasn’t a secret to anyone that a good portion of the guests were doing cocaine. The morning came a bit too early after the St. Patty’s day party, as a swarm of armed policemen raided the hostel looking for drugs. This is the ultimate place to celebrate St. Patrick’s Day in La Paz, but I would recommend staying elsewhere and coming for the party (especially if you don’t enjoy your belongings rifled through by cops before dawn breaks). My top choice for La Paz Bolivia! 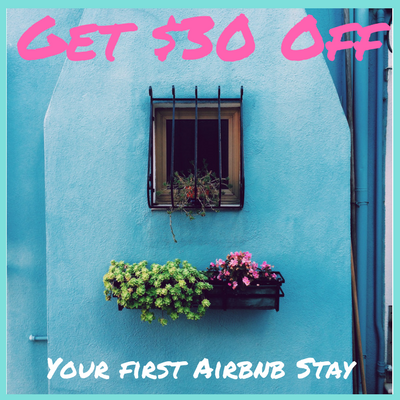 Located right next to the bus station (perfect for catching an early bus, or coming in off a late one), Perla Negra is also just a twenty minute walk to downtown where all the action happens. The staff were super nice and let me check in at 6am when I arrived off a night bus. The hotel is located in a gorgeous old house with antique furniture and stained glass. The breakfast is served bed and breakfast style, and gives you a friendly family feel for local life. 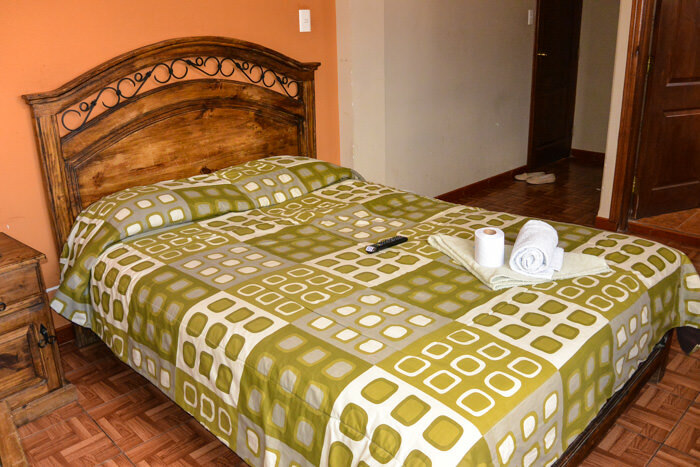 Conveniently located near the yellow line teleferico, this boutique hotel provides comfortable rooms and a tasty breakfast. Decorated in a modern style, Stannum Boutique Hotel features contemporary design and luxurious rooms. Boasting a beautiful spa and indoor pool, but slightly outdated furniture, Hotel Europa is a comfortable choice in La Paz. 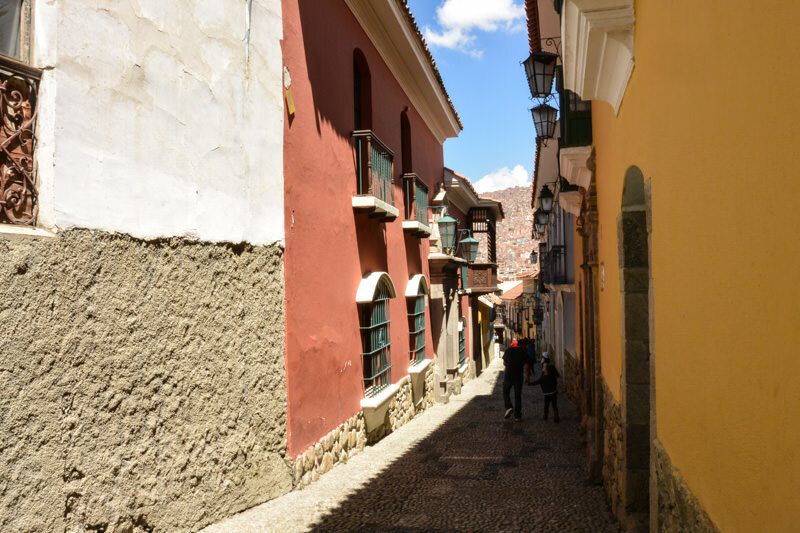 La Paz’s tourist strip is located on the narrow and steep Sagarnaga Street. It is packed with artisanal and souvenir shops, restaurants, hostels, tour agencies, and cafes. I bought my bright striped backpack here! Also known as Mercado de las Brujas, it is located on Calle Linares between Sagarnaga and Santa Cruz. It is easily missed as it consists of just a few shops, which you need to enter to fully understand. Strange items like llama fetuses (to put in the foundation of a new home for good luck), lucky figurines, and every kind of “potion” you could imagine are on offer. Home to several museums, Calle Jaen is a car-free walking street lined by colorful colonial buildings. According to local legend, it is also home to a ghost. 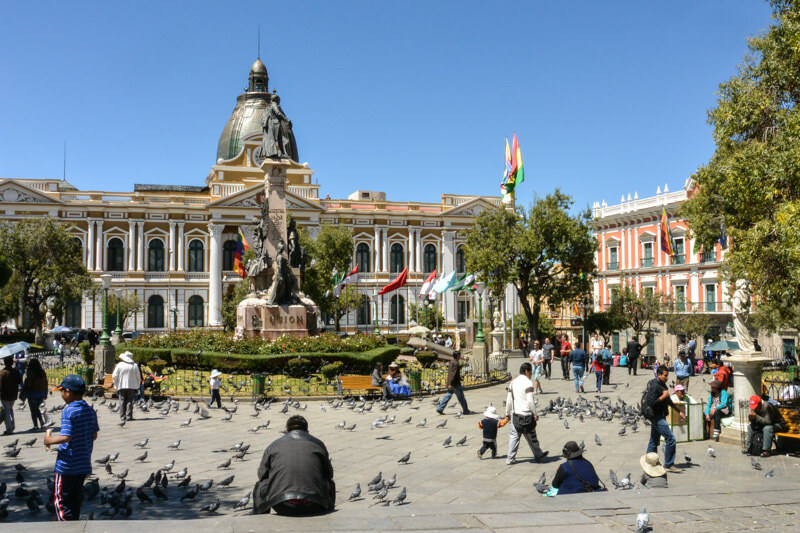 A beautiful plaza (home to a few too many pigeons), Plaza Murillo is surrounded by government buildings and the city cathedral. Not to be confused with the area of the same name south of the border in Chile, La Paz’s Valle de la Luna is almost an hour outside of the city. Most people visit on an organized tour, and the main attraction is the moonlike landscape (hence the name). 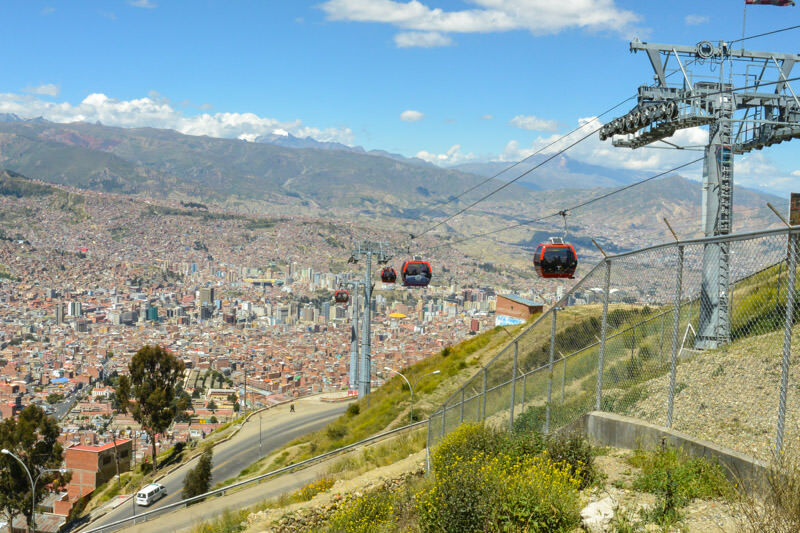 Taking a ride on one of La Paz’s telefericos is a great opportunity to get a birds-eye view of the city. With your choice of three lines, the Red line was my favorite. The Red line starts from the Estación Central “Taypi Uta” near the bus station, and brings you up past the cemetery and onto El Alto. The Green starts in Zona Sur, goes over Obrajes, and ends at the start of the Yellow Line. The Yellow Line goes into Satelite in El Alto. All of the lines run from 5:30AM-22:30PM and cost 3Bs per ride. 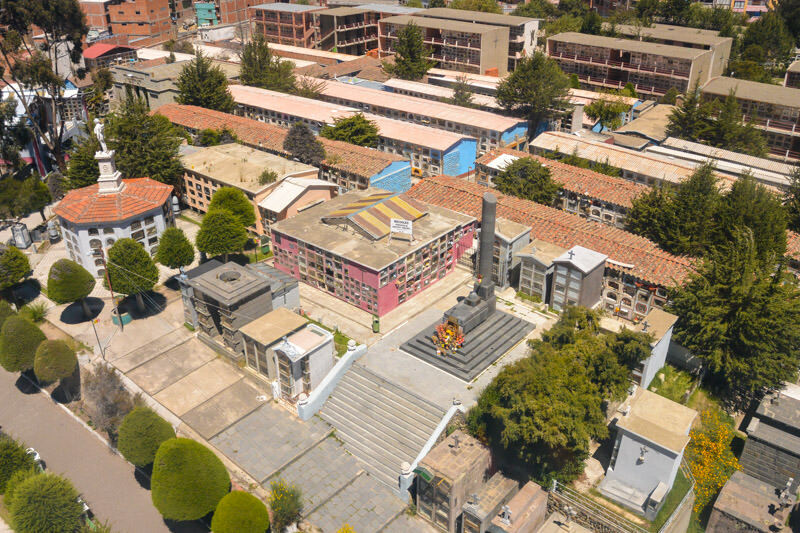 Using the Red line of the teleferico, you can reach La Paz’s famous cemetery. More beautiful and peaceful than any other cemetery I’ve ever visited. Remember to be mindful and respectful during your visit. Brave the World’s Most Dangerous Road by tapping into your best biking skills. This adrenaline-packed adventure also affords some stunning views of the mountainous terrain surrounding La Paz. 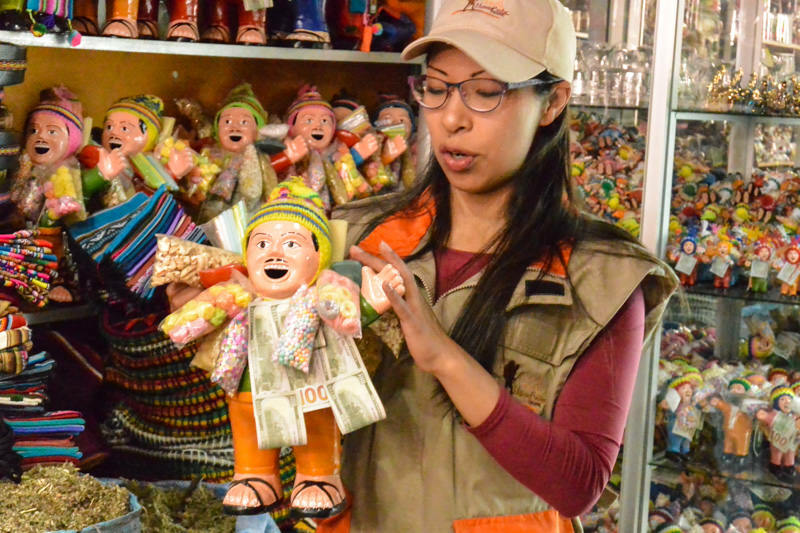 The La Paz walking tour is only 3USD when booked with Viator, and includes stops at the Cathedral, Plaza Murillo, San Pedro Prison, the Witches’ Corner, and more. 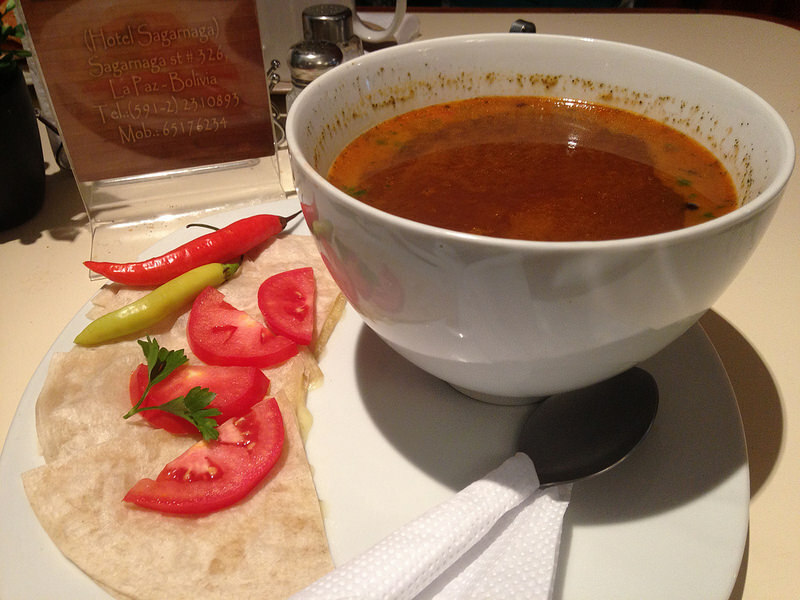 With a variety of cuisine cultures to choose from (including Mexican, Asian, and South American), every dish was both huge and delicious at super affordable prices (20-35B). The Mexican Soup with Quesadillas was my favorite non-vegan choice, and the salads were tops as well (especially Ensalada de Tijuana and Ensalada Oriental). Smaller portions as compared to Cafe del Mundo, but similar prices. All products are Bolivian and 100% natural. Star of India (Calle Cochabamba 170) The highest altitude British Curry House in the world, and with a selection of reasonably priced wine, this Indian restaurant didn’t disappoint. Tomate Cafe (Calle Ayacucho 376) Excellent value choice. Mains starting at 20Bs, and a set menu for 25Bs. The restaurant also offers wifi and a clean bathroom for guests. Armonia (Ecuador 2284) Tranquil environment with a buffet option and many vegetarian choices. Epico (Calle 14 Calacoto Sanchez Bustamante) Near the Green Line Teleferico, only offers lunch. Sources vegetables from a local chemical-free farm. Red Monkey (Calle 30 ‘D’ N0 9, Achumani) Tasty vegan food with mostly organic options. A small but deliciously curated menu. Marrakech (Calle Jimenez 774) Middle Eastern food with an emphasis on vegetarian choices (including falafel and hummus). 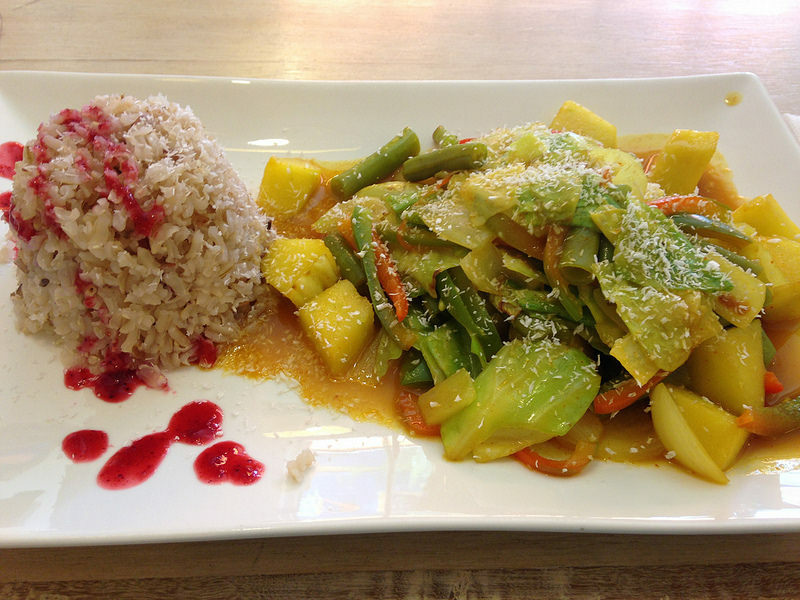 Namas Te (Calle Zoilo Flores #1334) Set lunch for 29Bs, with 4 courses (changing daily). Pizza Frak (near Hostal Perla Negra) Not the best pizza in the world, but they do have a vegetarian option packed with veggies. Bolivia actually has two capital cities. Sucre is the constitutional capital and the seat of the Supreme Court, but La Paz is the administrative capital of Bolivia. 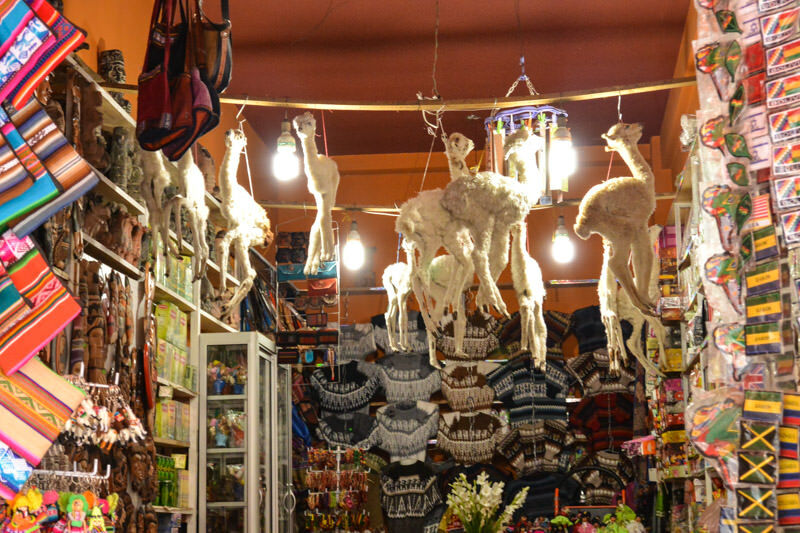 Pin this La Paz Bolivia guide for later! 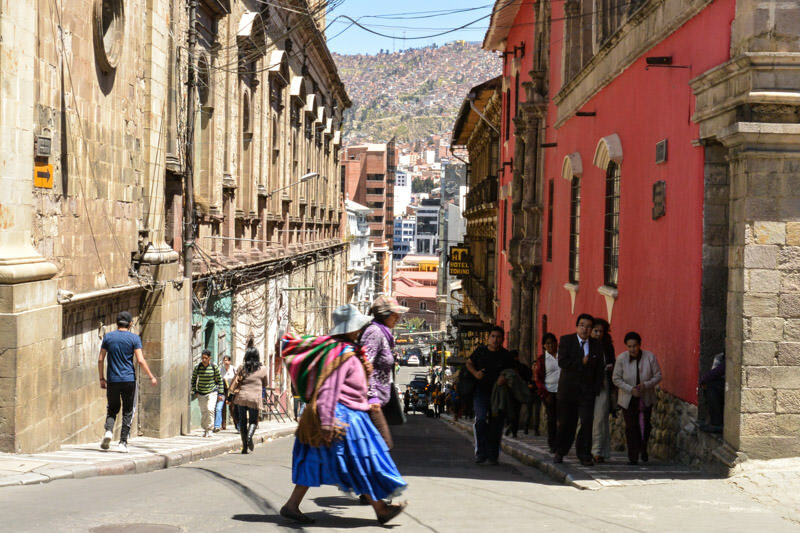 Have you been to La Paz Bolivia? Any tips I’m missing that you’d add? I’m taking my kids to Bolivia next month! We decided to stay in La Paz for one month and do day trips around there. Any recommendations? Awesome! 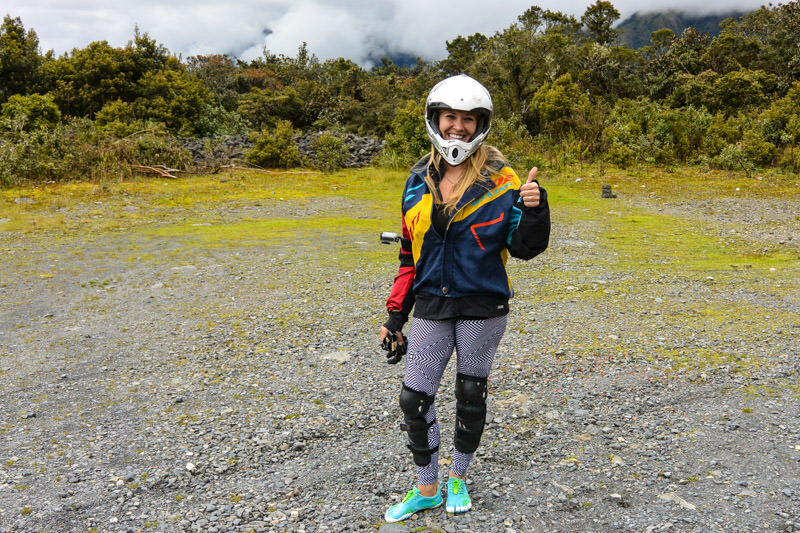 Most of the activities we got up to were quite adult-focused (involving alcohol, or a ride down the World’s Most Dangerous Road), but I documented everything here, there might be a few kid-friendly ideas in there, like taking the teleferico up to see the city from above. That was really cool! La Senda Verde (which I haven’t visited but have heard great things about) is a wildlife refuge and rehab center a day trip from the city. I hope you guys have fun! I loved La Paz. iam flying into la paz el alto airport fron london and am a bit worried about altitude. do you feel it straight away and what can i do to prevent it? dont want to take medications, is there another tea i can drink other than mate de coca? Hey Izzy! The best advice I received was to take it very, very slow. Walk slowly, don’t do too many activities, and don’t exert yourself AT ALL, at least not for the first day or two. Drink a lot of water. Aside from coca tea, ginger tea and green tea are also supposed to help. Avoiding alcohol, smoking, and caffeine are also advised. Hi! I’m actually flying out to El Alto tomorrow! 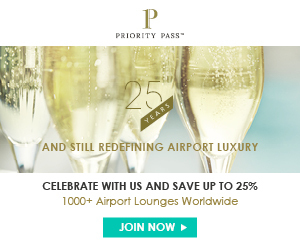 I’m excited but as a solo female traveller I’m a bit nervous taking a cab from the airport to my hotel on my own. Do you think the taxi cabs are comepletely safe to take alone? Also my Spnish is very basic – did you get by on speaking English? Hi Nehha! I took a cab from the airport to the hotel on my own, but I double-checked with one of the airport staff about which taxis are safe/registered. I felt like it was totally fine. If you do not speak Spanish, you need to bring a Spanish phrasebook/guidebook. I speak Spanish and there were many instances where no one around spoke English (including at the airport when I asked about the taxis). None of the cab drivers I encountered spoke any English, in the whole country of Bolivia. 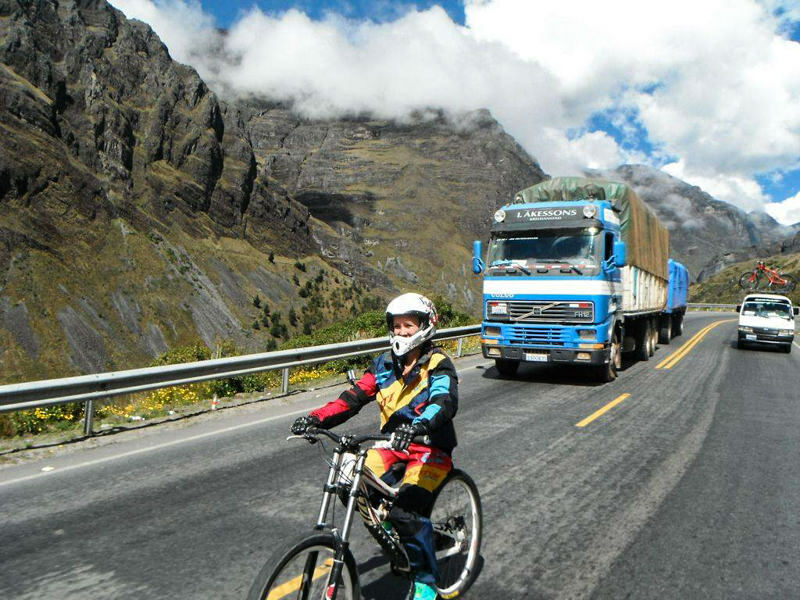 We were in La Paz and Bolivia last year and we enjoy it so much and Death Road biking was an unforgettable experience. But to be honest I like more other cities in Bolivia than La Paz, such as Sucre or Copacabana. Awesome article, thanks for the tips! Indeed, Bolivia a beautiful country in South America that is bisected by the majestic Andes, and is home to the gorgeous Lake Titicaca which straddles Peru and Bolivia. Do be wary of the fraudulent prison tour, overcharging vendors, medical bill extortion, longhauling taxis, bag theft, hotel tax, corrupt police officers and many more!